The slow parliamentary progress of the Higher Education Act is stirring some fundamental debate about the very definition of a university. 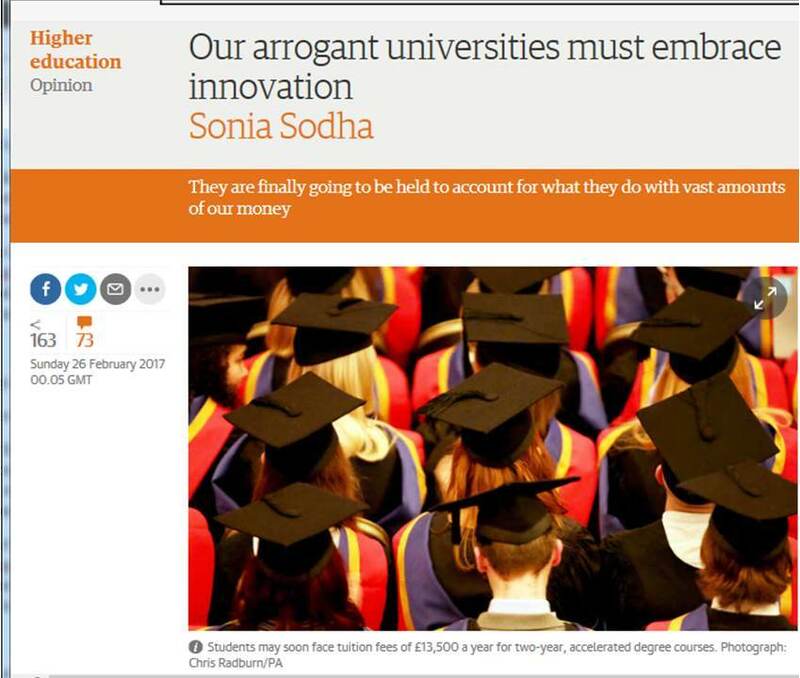 And for an example of why this might be important, we need look no further than Sonia Sodha’s attack on ‘arrogant’ and ‘dinosaur-like’ universities. It demonstrates how a narrow focus, coupled with an irresponsible misuse of evidence, can make universities look rather staid and wasteful. This must be challenged. Sodha looks at universities entirely as providers of undergraduate education. As a result, she asks, why can’t we all provide degrees at the same price as, say, the private provider BPP does with its Law degrees. Indeed, why should we cost more than schools? Well, that’s one way we could look at the university system. But that would be to trash an awful lot of other activity, including research, public engagement, partnerships with business and industry, government consultancy, and so forth. Do we want universities to be internationally competitive? Do we want them to attract international students, worth billions of pounds to regional and national economies? Do we want them to forge regional and international partnerships for research and innovation? Do we want to attract the world’s best academics to the UK? Maybe some people don’t want any of that at all. After all, if international students look too much like migrants, maybe some people rejoice in the recent downturn in enrolment numbers. Maybe some people hanker after a time before global league tables – before, even, globalization itself – when universities taught British students to go forth and work in Britain. But maybe – just maybe – that’s all a little bit out of touch with reality. Simplistic definitions lead naturally enough to a lazy treatment of evidence. Sodha points out that the cost of British public university education is the highest in the OECD. True enough, if approached from the perspective of the student; however, this is a product of the state’s withdrawal of funding. While the state underwrites student-loans on advantageous terms, most likely incurring considerable cost in the process, the up-front fees for many degrees are borne entirely by the students. In the humanities and social sciences, a student’s £9000 per year is all we get to cover the cost of his or her education. As for her claims that British universities lack transparency: well, some people lack the energy to look at what’s staring them in the face. How about unistats? It provides information, by programme, on student satisfaction, graduate employment, as well as all sorts of information about how programmes are delivered. If someone wants to find out about contact hours, class sizes, assessment models, and so forth, universities aren’t hiding anything. Wait just a couple of months and the Teaching Excellence Framework will disgorge further reams of information. Meanwhile, information about staffing – who we employ, even how much we pay them – is also easy enough to find on any university website. And so to innovation: we’re all just doing what we’ve always done. Well that’s perhaps the sloppiest of cliché-driven assertions in her entire piece. It overlooks the year-to-year reforms that happen in every programme in the country as we respond to student feedback and other evidence from a fiercely competitive marketplace. So in my department, to take some examples from recent years, we have: increased contact hours, decreased seminar sizes, introduced video-recording of all lectures, committed ourselves to returning feedback on written work within three weeks, diversified our assessment models, introduced employability-driven modules – and I could go on. If that’s not enough, how about some reforms at programme level? We introduced a Liberal Arts programme, aiming to stretch students beyond Single Honours models. We have increased our provision of study abroad. We’re increasingly looking afresh at online learning, whether in the form of MOOCs or on a more formal and commercialized basis. And at a postgraduate level, we have forged innovative partnerships, such as (in my own department) the London Film School. Looking further afield: how about the New College of the Humanities? Maybe this is not quite what Sodha has in mind in terms of costs, but what I like about it is the honesty on the principle that excellence – innovative or not – can’t be done on the cheap. We’ve got a diverse, vibrant, competitive sector – but maybe Sodha prefers a stereotype forged a generation ago. I’m not going to argue that UK higher education is perfect, but let’s have a reality-check. If we’re going to attack universities, let’s first define what we mean and what we want from them. And if we’re going to make outspoken assertions, let’s do a little research. That’s the kind of basic academic responsibility we teach our students. And while academic responsibility is perhaps an old-fashioned value, I’d suggest that it’s proved its worth over the years. This piece was published, in slightly different form, by the i news.